Form IR526 is a New Zealand Inland Revenue Department form also known as the "Tax Credit Claim Form". 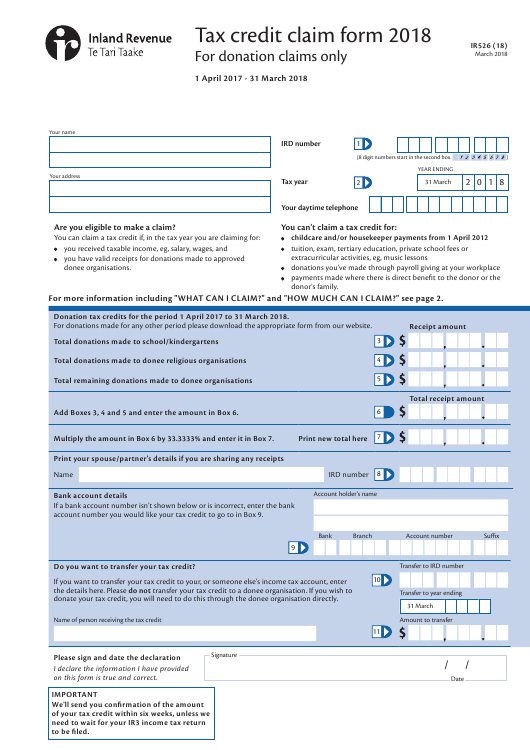 The latest edition of the form was released in March 1, 2018 and is available for digital filing. Download a PDF version of the Form IR526 down below or find it on New Zealand Inland Revenue Department Forms website. (8 digit numbers start in the second box. For more information including "WHAT CAN I CLAIM?" and "HOW MUCH CAN I CLAIM?" see page 2. Donation tax credits for the period 1 April 2017 to 31 March 2018. For donations made for any other period please download the appropriate form from our website. Add Boxes 3, 4 and 5 and enter the amount in Box 6. Multiply the amount in Box 6 by 33.3333% and enter it in Box 7.
account number you would like your tax credit to go to in Box 9. Do you want to transfer your tax credit? donate your tax credit, you will need to do this through the donee organisation directly. on this form is true and correct. Staple all donation receipts received between 1 April 2017 and 31 March 2018 here. • the word "copy" or "replacement" if it's a replacement receipt. CAN I CLAIM A TAX CREDIT? check your taxable income before we can process your claim. have no taxable income, so the credit cannot be claimed. • To avoid delays file your claim at the same time as you file your IR3. donor, or the donor's family. To claim a tax credit, a receipt must have the word "donation" written on it. If you have receipts, you can claim a tax credit for donations of $5 or more. • 33.3333% of your taxable income. made to school/kindergartens in Box 3.
religious organisations in Box 4.
or more, then they can claim the other $500. can assess your liabilities or your entitlements under the Acts we administer. • Payments made from 1 April 2012 for childcare and/or housekeeper payments are not eligible for a tax credit. means that donations made prior to 1 April 2014 can no longer be claimed. out a tax credit of $99.9999, your refund will show as $99.99. If your new address is a PO Box number, please show your box lobby if you have one. If you're unsure of your box lobby please contact New Zealand Post.